With the listing at Grade II of the ventilation shaft cover by Eduardo Paolozzi in Pimlico, London, we were excited to recently identify a plaster maquette for this sculpture held by the AA. 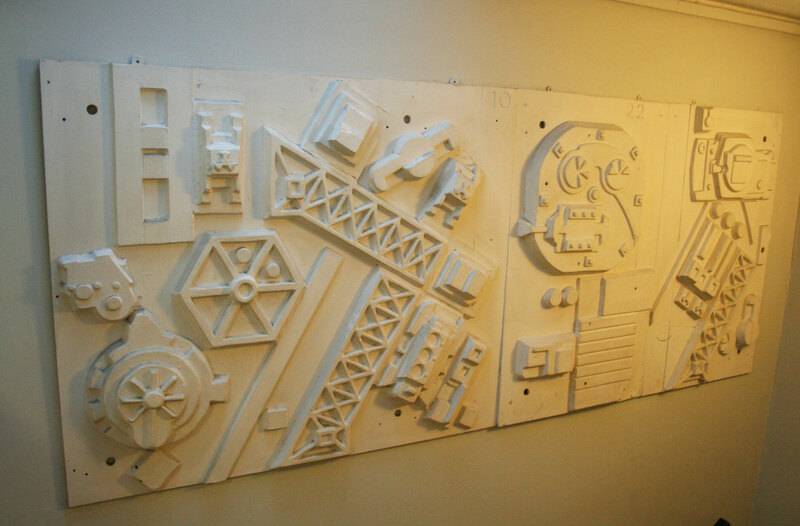 This maquette, formed of three plaster and wood panels, are for the base of the robot-like sculpture on the cooling tower in Bessborough Road, Drummond Gate, Pimlico, designed by Paolozzi and completed in 1982. The panels are numbered 10, 15 and 22 (the numbers are impressed in to the plaster) as appear on the panels of the sculpture itself. The panels are not currently displayed in the sequence they appear on the sculpture. One of the panels, number 10, is twice the size of the other two panels. All the panels have holes drilled through them like the sculpture (the holes on the sculpture are used to screw the panels to the base). 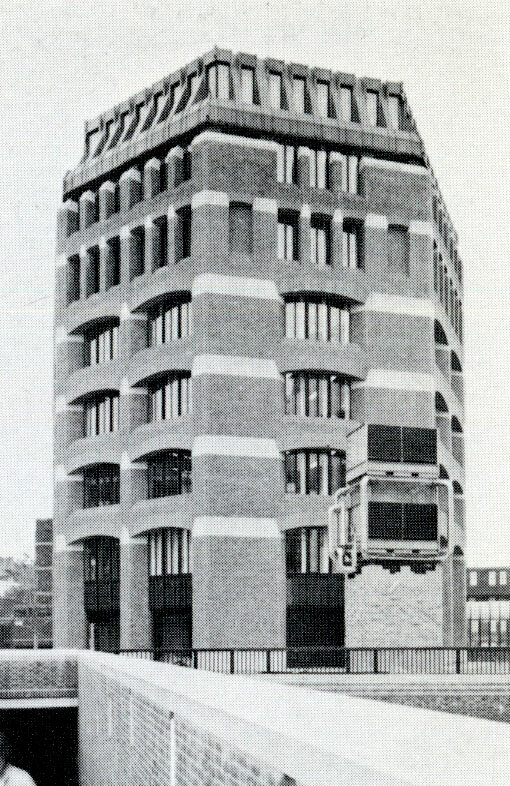 The cooling tower was commissioned by Crown Estate Commissioners through Whitfield Partners. It was located on the pavement between the buildings at Drummond Gate and was intended to form a marker between Pimlico underground station and the Tate. David Lyle of Whitfield Partners writes: ‘We felt that there was an opportunity for a major artwork which would creatively exploit mechanical and structural exigencies, an opportunity to transform a mechanical necessity into genuine sculpture. 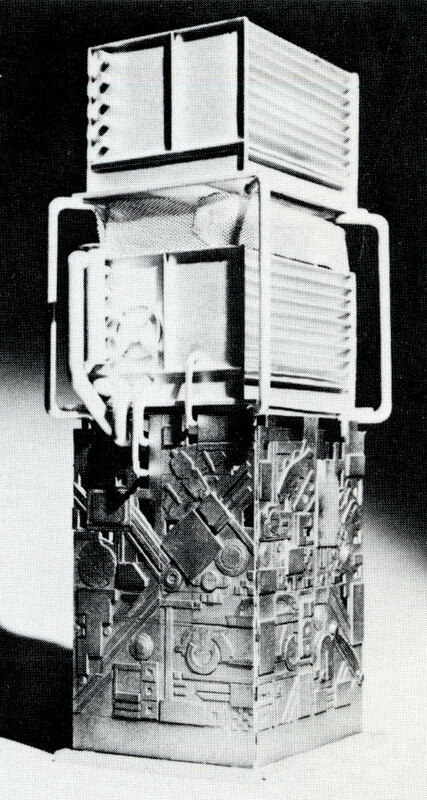 There was a chance to integrate the accidental visual qualities of miscellaneous engineering components into a single significant form making a powerful sculptural contribution to the urban scene’ (‘Eduardo Paolozzi: private vision – public art’, London: Architectural Association, 1984, p.30). The cooling tower consists of a concrete enclosure with a stainless steel tubular frame carrying the ejector coolers. The doors and cladding to the concrete are made of high-relief cast iron panels painted in aluminium and cast in sections. The maquette may have been acquired by the AA following the exhibition ‘Eduardo Paolozzi: private vision – public art’ held at AA from 24 February to 31 March 1984.